It’s been a few weeks since I decided to muck around with Twitter, and it’s been a learning experience to get to the stage I’m at. I bought 7500 and 8000 followers respectively through fiverr.com – a bad idea to do both at once, since both ‘professionals’ claimed they’d delivered after I got to 7800 followers. I couldn’t prove who did and didn’t do it, or if they’d both half done it… so just bought a third chunk of 7500. I wanted to get over the 10k mark as to me, that appears more impressive than seeing a number like “9,825” followers. 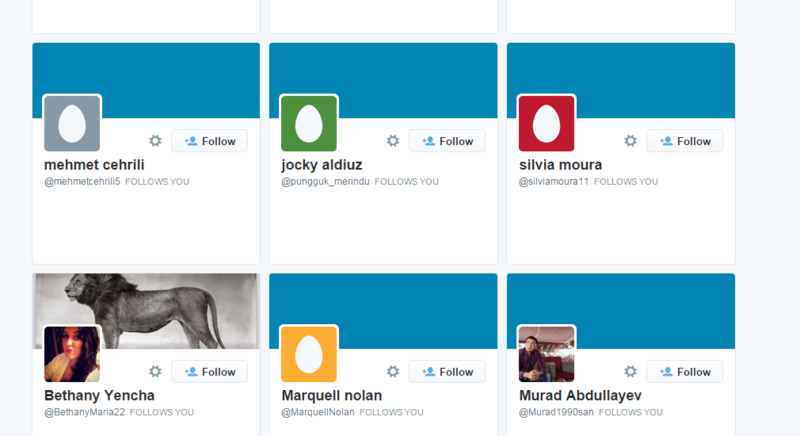 Apart from the eggs, there were a lot of non-English style followers. I feel bad because I’m sure these identities have been stolen for fake accounts (as in the photos, I’m sure the names aren’t real). It was at this stage I realised there’d be a bit more work to do, just having 15k followers wasn’t enough. I checked out IFTTT.com which can automate some Twitter things, but it seems Twitter has blocked a bunch of things I’d hoped to do. First I tried to follow everyone who followed me – I couldn’t find a way to do this at all. There was also no way to automatically follow anyone, nor a way to retweet anything automatically. I was trying to do all of these things to create content and contacts without effort. I dare say the exact reasons I was trying to do this, was the same reasons it’s not allowed. What I could do, was get IFTTT to search a hastag (e.g. #microsoft) and add that person to a Twitter list. IFTTT will only grab 30 results at a time, so it’s slow – but I figured people like being added to lists, and might follow my account after feeling special enough for being added to a list. You can see my #Microsoft list here and I did the same for #Windows here. There seems to be a mix of rubbish Twitter accounts along with real ones, so I’d say it’s been semi successful. I also found a service called roundteam.co that would retweet tweets from lists. I did this for a little while just to get my tweet count higher, but stopped it. Due to only using the free service, there were some rather heavy limitations, along with a daily “I’m using RoundTeam” tweet they kindly made my account do. I was hoping automatic retweets would do the same as adding someone to a list, while making my feed look useful. The problem I found was, I was often retweeting non-English tweets that used #Microsoft or #Windows which made my feed look pretty crappy. As a final attempt, I followed only a few tech Twitter accounts, added them to a list, and retweeted their tweets occasionally. This cleaned up my feed a bit, but it wasn’t really doing much to get social media influence. I then turned off all the automation, apart from the lists as I figured that wasn’t doing anything visibly obvious to anyone, apart from accounts added to the list. I managed to get some legitimate followers though, if you see who follows my account, the first few pages look pretty good. I have a feeling that if I now treated the account properly, created content and interracted with people it would be seen as a legitimate, popular account. What do you think?